After a grueling trailblazer through the desert the day before, our hardy riders were looking forward to trading in their dusty boots for flip-flops and riding on flashy Beneteaus in San Diego Bay, compliments of sponsor South Coast Yachts. Within minutes of departure we were cruising toward the Palms to Pines Scenic Byway up California Route 74 north through the San Jacinto mountain range. What a stark shift from the parched brown and gray terrain of the desert. The verdant mountains were lush, fragrant and bursting with cheery spring colors, wild flowers dotting the roadways. Adrenaline kicked in as we encountered a seemingly countless series of challenging mountain curves, twists and switchbacks as we zipped around mountains, past rolling meadows and horse-laden pastures and through charming towns, including Anza, Warner Springs and Santa Ysabel. We stopped for a brief respite and refueling in Julian, a historic 1870s town where California gold was discovered and a favorite among motorcyclists. Our trusty, California-bred road captain, Phil Arnold, navigated us effortlessly to I-8 and to our ultimate destination, South Coast Yachts, at Sunroad Resort Marina on beautiful Harbor Island in San Diego. The dealership is owned by business partners Barrett Canfield and Rick Day, who opened their doors in 2009. Prior to launching the dealership, Barrett had represented Beneteau for 18 years in the market elsewhere. Since its founding, South Coast Yachts has achieved notable distinction as one of the top three Beneteau dealers in the country and won the coveted Service Dealer of the Year award in 2012 for achieving the highest CSI scores in the nation. South Coast Yachts scored big with our crew. We enjoyed a simply amazing rock-star welcome as we thundered into the dealership. The staff, plus Sunroad Resort Marina general manager Jim Behun (who also manages the San Diego Boat Show), Marty Kamery, president of the District 38/Southern California American Motorcycle Association, and even the local BMW motorcycle dealership owner were on hand, awaiting our arrival. As we rolled into the VIP spots designated for our bikes and cut off our engines, the entire group, including host and riders, collectively burst into a joyful cheer and group hugs. We had made it. And now we were all so ready to relax, kick up our weary heels, celebrate and party. Barrett, a savvy marketer, had pitched and successfully secured a surprise TV interview for me with local ABC news anchor David Davis, himself a Harley owner who rode in on his own pearl-white Road King to cover our story, which will accompany an overall piece on the harbor. Following the interview we were treated to a truly fabulous lunch served poolside, and Lordy, what an impressive spread it was! Rick himself grilled burgers and dogs for us, complemented by a whole host of delicious sides and icy-cold beverages. Then the moment arrived that we had all been greatly anticipating. Barrett and his friendly and highly experienced crew invited us to board one of two spectacular Beneteaus — a beautiful new Gran Turismo 44 powerboat with a joystick Volvo maneuvering system or a new Beneteau Oceanis 41 sailboat owned by Sue and Lee Glascoe of Chandler, Ariz., who are also boaters and motorcycling enthusiasts and generously loaned their boat for this special occasion. For the next two hours, our riders and the South Coast Yachts crew laughed, relaxed, reminisced and posed for a million pictures as we cruised and rendezvoused on San Diego Bay. It was a picture-perfect day, sunny and warm with sufficient wind to release the sails, blazing blue skies, and so much more — like playful seals frolicking together — followed by a half dozen or more boatloads of Navy SEALs, who throttled past us en route to an apparent training mission. We observed two $43 million Navy Sea Hawk helicopters buzzing overhead, along with an F-5 under way in an adversarial training exercise. We felt like Top Guns! The best part of it all, however, was just being there on the water aboard these fantastic, state-of-the-art Beneteaus and soaking up the boating lifestyle. 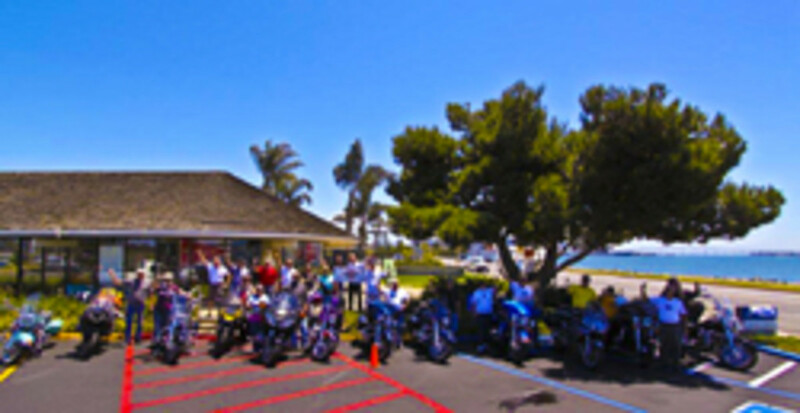 “Boaterz n Bikerz Across America” had, in fact, lived up to its “Hull of a Tour” tagline, with 10 amazing days and nearly 3,000 miles of fantastic boating and biking adventures to its credit, culminating at this final awesome stop. After bidding heartfelt thanks and fond farewells to our gracious South Coast Yachts hosts, we rode to our hotel on the bay, cleaned up and shared one final evening and dinner together in the famous Old Town district of San Diego. As I looked around the table and into the eyes of each person who shared this epic adventure — and recalled those who had been part of it through riding or sponsorship participation — I was reminded of just how lucky I am to live and breathe boating as my lifelong career and profession — to ride both on the water and on the road as my passion — and to have new friends and old alike who share my spirit for adventure and my DNA. Thanks for joining vicariously on the ride — and yes, before you ask — the Hull of a Tour-Deuce 2014 is already throttling forward in discussion. Stay tuned. 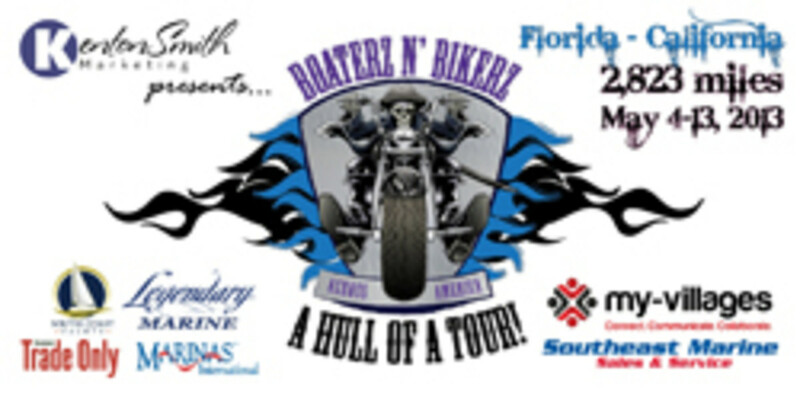 Thanks to the “Boaterz n Bikerz Across America: A Hull of a Tour” sponsors joining presenting sponsor Kenton Smith Marketing, including Legendary Marine, Marinas International, South Coast Yachts, My-Villages, Southeast Marine Sales & Service and media sponsor Soundings Trade Only Today. Wanda Kenton Smith is an award-winning, 31-year marine industry marketing veteran based in Destin, Fla. She is the president of Kenton Smith Marketing (www.kentonsmithmarketing.com) and president of the Marine Marketers of America. For more information about the 2013 Hull of a Tour and/or future plans, join the Facebook group page https://www.facebook.com/#!/groups/HullofaTour/ or email wanda@kentonsmithmarketing.com.